On 29 January, the LNA arrested al-Qaeda member Alamin Ali Kalfa near Sebha. On 2 February, LNA forces and the Derna Protection Force clashed in the old city area of Derna. On 27 January, the LNA claim to have killed AQIM field commander Adel Ahmad al-Abdali during a raid in the Hijarah area of Sebha. On 24 January, Anti-Terror Forces in Misrata arrested a terror suspect, Ali Amin. On 27 January, the Criminal Investigation Agency of Misrata arrested terror suspect, Zakaria Saleh al-Sheikh, in Misrata. On 21 September, suspected Al-Qaeda members launched an attack using an RPG on a senior security official in Sebha. On 13 March, clashes continued in Sebha between Tebu and Awlad Suliman militias. On 12 March, UN envoy Ghassan Salame met with a delegation from southern Libya in Tripoli to explore ways of resolving the violence in southern Libya. On 9 March the LNA declared that all “Africans from neighbouring countries” had to leave Libya by 17 March or they would be expelled by force. On 6 March, local sources reported clashes between Tebu and Awlad Suliman militias involving tanks in the Nasriya area of Sebha, north of the airport. Fighting between the two groups has also intensified in the Tayuri district of Sebha, an area populated with Tebu and Tuareg groups. The LNA-affiliated 116 brigade reportedly arrested a jihadist cell, including an ISIS member, in an anti-terrorism raid in Sebha. Three members of the al-Bunyan al-Marsus 166 brigade were killed in ambush south-west of Sirte, suspected to have been carried out by ISIS fighters. On 28 April, the LNA conducted two airstrikes against a local militia camp linked to the BDB in Jufra and restarted airstrikes against the Teminhint airbase which is still held by GNA-aligned forces. LNA airstrikes in Sebha threaten Haftar’s alliance with Tebu forces. 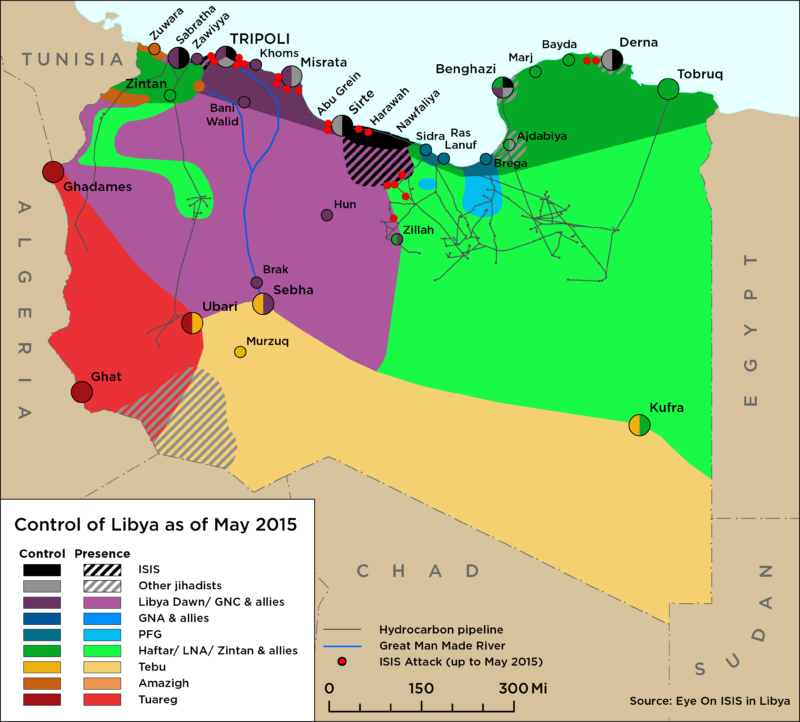 On 13 February, the GNA claimed that it had coordinated an airstrike with joint U.S.-Libyan forces targeting al-Qaeda members near Awbari. The Libyan National Army (LNA) has begun the second phase of its ‘Operation Southern Liberation’ this week, advancing on Umm al-Aranib and launching airstrikes in the Murzuq area. 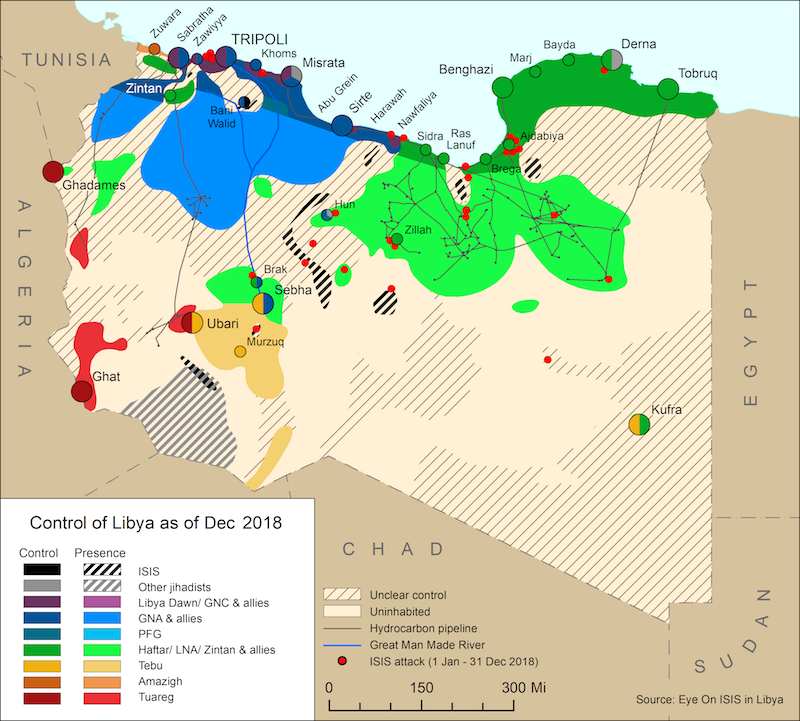 On 23 January, the LNA spokesman Ahmed al-Mismari labelled UN Envoy to Libya Ghassan Salame as an ‘opponent.’ The military campaign launched by the LNA to exert its control over the southern region made notable progress. On 26 January, the head of the HSC Khalid al-Mishri resigned from the Muslim Brotherhood. On 21 January, a ceasefire agreement was reached between the TPR and the 7th Brigade following clashes in southern Tripoli. Over the last week, the Libyan National Army (LNA) has continued to consolidate its presence in and around Sebha as a part of its campaign to secure the southern region.